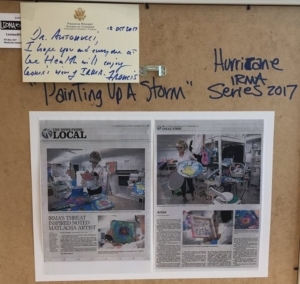 I reported back on October 1st that Congressman Francis J. Rooney purchased a series of paintings I did on Hurricane Irma. I expressed confidence at the time that he’d give the collection a good home. Well, I just learned where one of series ended up, and it’s a good home indeed. 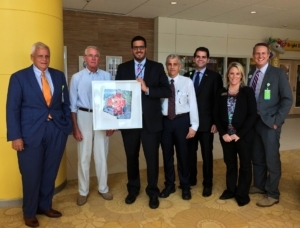 Congressman Rooney stopped by Golisano Children’s Hospital of Southwest Florida yesterday to thank the hospital and Lee Health staff for their service during Hurricane Irma and presented the hospital with my Hurricane Irma painting titled Painting Up a Storm. I’m so pleased. And not only will Painting Up a Storm bring smiles and joy to everyone who sees it thee, Congressman Rooney’s acquisition of the entire Hurricane Irma series gave me the opportunity to help the South Florida Red Cross during this time when so many of our family and friends continue to recover from the storm. Thank you Congressman Francis Rooney for your support of our nation, the 19th Congressional District and all you are doing for our community!